These trace numbers 1-20 worksheet set wouldn’t be complete without a page where all the numbers need to be traced. Use as classroom practice for all students, fast finishers, or for assessment purposes. 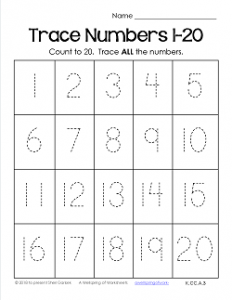 Please go to this page to see all the trace numbers 1-20 worksheets in this set.